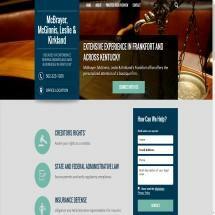 At the Frankfort office of Kirkland, Cain & Horn, PLLC, our attorneys have the knowledge and experience to effectively represent individuals, businesses and other organizations of any size operating anywhere in Kentucky. Our Frankfort office is located very near to the Capitol Building because we work frequently with Kentucky's lawmakers and civil servants to find solutions for our clients' legal needs. We have an extensive network of contacts in state and local government, and those relationships help us quickly make contact with the proper agencies and officials to secure business permits, clarify ambiguous regulations and resolve any other government-related legal queries. Our clients include individuals, small and large businesses, financial institutions, nonprofit organizations, political campaigns, and any other organization in need of legal representation in Kentucky. Ultimately, our goal is to get results for our clients, whether your case is related to creditors' rights, administrative law, insurance defense, labor and employment law, and several other practice areas. We listen to our clients' needs and tailor our legal strategy to the details of each case.